CARFAX One-Owner. Clean CARFAX. Black Noir Pearl 2018 Hyundai Elantra SEL FWD 6-Speed Automatic with Shiftronic 2.0L 4-Cylinder DOHC 16VRecent Arrival! 28/37 City/Highway MPGWHY CHOOSE HAMER TOYOTA? SIMPLE - we choose volume sales over large profit margins! Serving the good folks of the San Fernando Valley from the same corner since 1939, we are in the TOP 10 IN THE USA on Certified Pre-Owned Toyotas and every pre-owned vehicle passes inspection or we don't sell it!! Our Service Department is filled with Toyota Master Technicians who care, our Parts Department is fully stocked, we offer a free shuttle during your service, and provide free wifi in our Customer Business Center. Buy from Hamer and receive a 15% Off Parts Card good for life! At Hamer Toyota, WE HEAR YOU! CARFAX One-Owner. Clean CARFAX. Symphony Air Silver 2018 Hyundai Elantra SEL FWD 6-Speed Automatic with Shiftronic 2.0L 4-Cylinder DOHC 16VRecent Arrival! 28/37 City/Highway MPGWHY CHOOSE HAMER TOYOTA? SIMPLE - we choose volume sales over large profit margins! Serving the good folks of the San Fernando Valley from the same corner since 1939, we are in the TOP 10 IN THE USA on Certified Pre-Owned Toyotas and every pre-owned vehicle passes inspection or we don't sell it!! Our Service Department is filled with Toyota Master Technicians who care, our Parts Department is fully stocked, we offer a free shuttle during your service, and provide free wifi in our Customer Business Center. Buy from Hamer and receive a 15% Off Parts Card good for life! At Hamer Toyota, WE HEAR YOU! 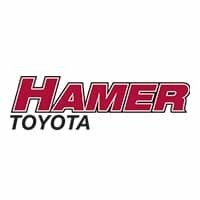 Hamer Toyota has a great selection of quality used vehicles to choose from. If you are searching for a reliable and affordable used vehicle, our team is here to help. We are always adding great vehicles to our inventory of used cars. With our customer-centered approach, finding your next vehicle has never been easier. We are confident that we will be able to help you find the right vehicle for your lifestyle. All of our Used Vehicles have been thoroughly inspected to ensure quality and reliability. To help make your shopping experience easier, use our convenient ‘Payment Calculator’ tool to estimate your vehicle’s monthly payment. Once you find a vehicle that you are interested in, fill out the contact form and we will reach out to you to verify the vehicle’s availability. To talk with our team, please contact us at (855) 592-7001.